Maize or corn, one of the staple foods in a few countries, has gained popularity in India as a breakfast and snack option. Be it boiled sweet corn, baby corn, boiled corn cobs or cornflakes, all are fast moving in the market today. • It improves digestion as it is a rich source of fibre preventing haemorrhoids, constipation and the risk of colon cancer considerably. 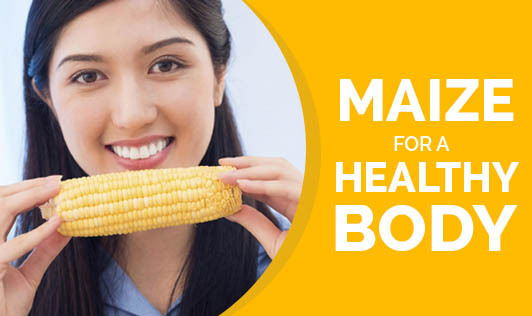 • Maize is also a powerhouse of minerals like iron, magnesium, copper and phosphorous necessary for bone development and to enhance normal kidney functioning. • Sweet corn helps reduce the risk of anemia as it is rich in B-vitamins and folic acid. • The presence of antioxidants like carotenoids has anti-aging properties which helps you look younger. • Corn starch helps reduce skin irritations. • It is beneficial to keep the heart healthy by reducing bad cholesterol in the body with the help of carotenoids, vitamin-c and bioflavonoids present in corn. • It is proven to be beneficial for expecting mothers due to the presence of folic acid which is essential to prevent neural tube defects. • Thiamine (vitamin-B1) present in corn helps in the normal functioning of muscles and the nervous system. Corn is a rich source of many vitamins and minerals that can help you be healthy. So, have corn at least once or twice a week to reap the benefits.